800 members. Part of his diary from those years was published in 1929 as Leaves from the Notebook of a Tamed Cynic. During that time he began to attract attention through articles on social issues; as he said, he "cut [his] eyeteeth fighting [Henry] Ford." But the socialism to which he was attracted soon seemed naive to him: human problems could not be solved just by appealing to the good in people or by promulgating programs for change. 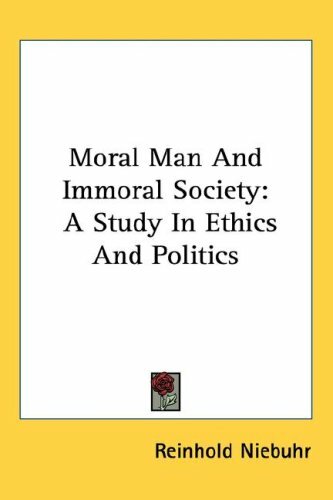 Power, economic clout, was needed to change the systems set up by sinful groups, a position expressed in his 1932 book, Moral Man and Immoral Society. By this time Niebuhr was teaching at Union Theological Seminary in New York, where he spent the rest of his career. Niebuhr's theology always took second place to ethics. He ran for office as a socialist, rescued Paul Tillich from Germany, became a strong supporter of Israel, gave up pacifism, and was often too orthodox for the liberals, too liberal for the orthodox. His The Nature and Destiny of Man is one of the few seminal theological books written by an American. In it he reiterates a theme that led some to place him in the Barthian camp of Neo-orthodoxy: the radical sinfulness of the human creature. The human condition as illumined by the Christian tradition was always the arena in which he worked.